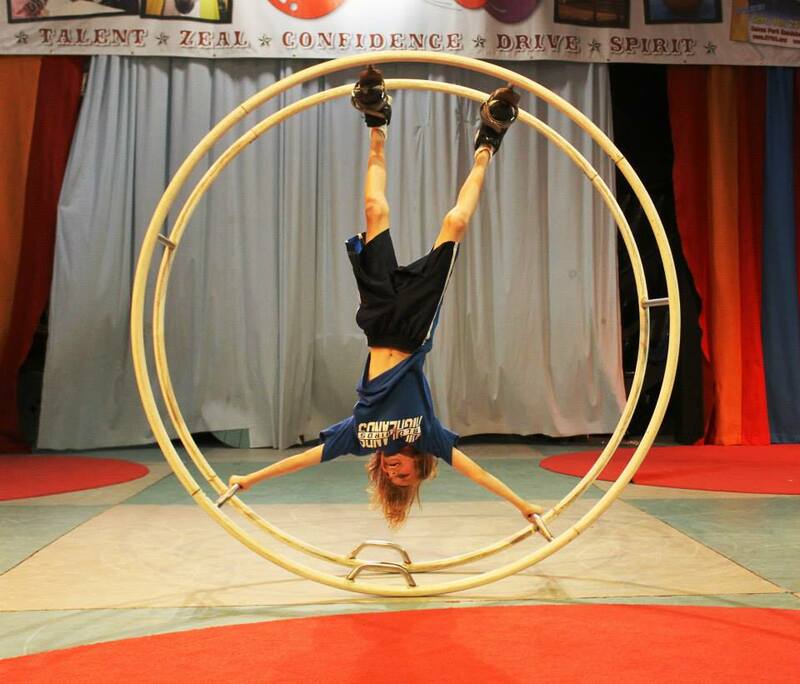 Joey Holt, a 14-year-old Fort Thomas resident who is an 8th grader at Highlands Middle School, is running off to Germany with the circus this summer. 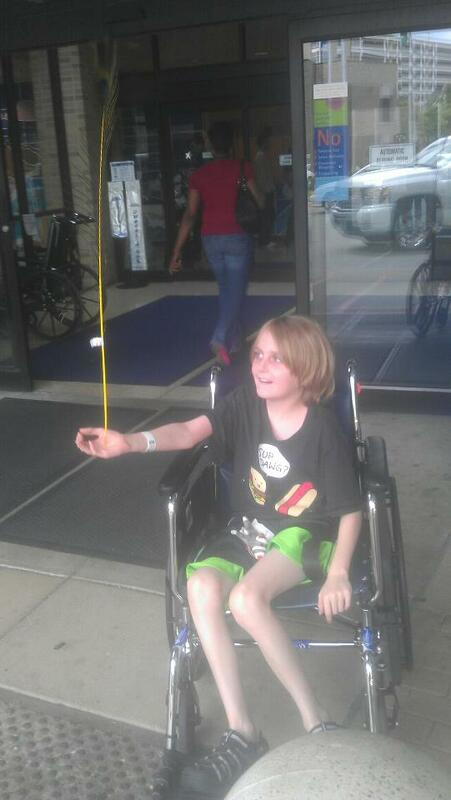 My son Joey really is an extraordinary kid who has defeated a rare disease called Langerhans Cell Histiocytosis. The cancer attacked his hip bone causing him to need a bone graft and making doctors wonder if he would ever walk again. After months in a wheelchair, years of physical and occupational therapy and counseling for Post-Traumatic Stress Disorder, not only can Joey walk, he can perform in a German Wheel and do tricks on a cable wheel. Joey met Paul Miller, owner of Circus Mojo, and some of his team at Cincinnati Children’s Hospital while waiting to see doctors in 2010. Joey enjoyed their entertainment so much that he asked me to schedule his appointments for when they would be in the waiting room. They taught him to balance a feather on his hand, spin plates and a little bit of juggling. The next year was quite a battle for Joey. He was in a wheelchair, doing therapy, dealing with nerve pain, in and out of the hospital as an inpatient all while trying to go to school. He was a fighter though. The next summer, 2011, I won a week of camp to Circus Mojo from a local blogger. Joey was ready to go learn more tricks but was using a wheelchair and crutches again due to pain. Paul said they would work around it and to send him to camp anyway. Joey was so determined to be able to do the silks, German wheel, cable wheel and everything else the circus had to offer that by the end of the week, Paul was balancing the wheelchair on his chin and Joey balanced the crutches in his hand. Joey fell in love with circus that summer and has been working with Mojo ever since. He trains every Saturday, performs for the public every chance he gets, attends summer camps and practices constantly at home. His hard work has paid off. Circus Mojo is taking Joey to Germany this summer to train with Circus Pimparello for a few weeks. His trip is estimated to cost approximately $2000. 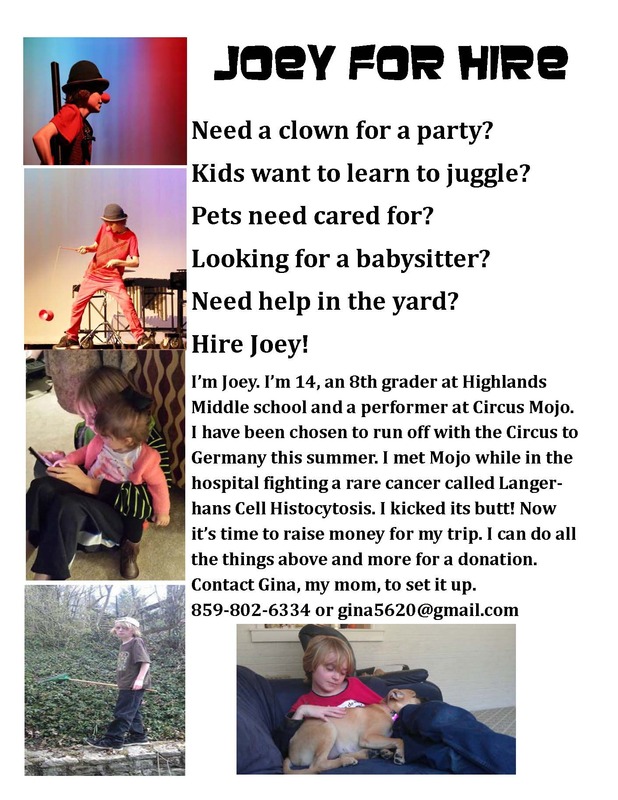 Joey is for hire to perform at parties, teach kids circus tricks, babysit, take care of pets and do other odd jobs. All money earned will go toward his trip. You can also help give Joey a chance of a life time by sponsoring a portion of his trip with a tax deductible donation. Donations can be made to Circus Mojo’s Foundation, The Social Circus Fund, at https://socialcircus.wordpress.com. Just click on Donate Here. Donations can also be mailed to the Social Circus Foundation, 326 Elm Street, Ludlow, Ky., 41016. PLEASE write in the memo or comments that the donation is for JOEY HOLT’S Germany Trip. Please contact Gina (gina5620@gmail.com) or Nick Stegner (nstegner68@gmail.com) with questions or to hire Joey. My heart sunk. Joel was 19 at the time and just started his first year at Eastern Kentucky University. I thought he was spending the weekend resting in his dorm so my first thought was they were wrong. They had the wrong kid. But then it sunk in. He was on his way back from visiting his girlfriend at Murray – a five hour drive. I don’t even really remember driving home from soccer registration. I just had to get to my husband. That night was the beginning of a three month stay in hospitals. 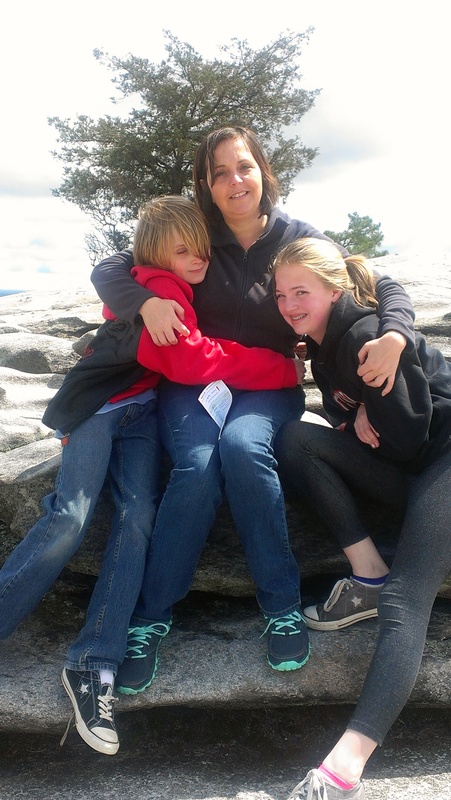 I watched my step-son fight for his life and win. Doctors were baffled on how he survived but he did. He is still in recovery but is going to be as good as new. Family support, prayer, friends, amazing health care providers and his determination made him survive. This wasn’t my first experience with hospitals and praying that a child can overcome the odds. My now 14-year-old son Joey was diagnosed with Langerhans Cell Histiocytosis almost four years ago. He had to undergo a bone graft of the hip, spend months in a wheelchair, years in physical therapy and lots of a counseling for PTSD. He is doing amazing now (I have to give partial credit to Circus Mojo in Ludlow, Ky, for that. They have kept Joey physically fit and give him something to look forward to). Joey’s diagnose changed me for the better. I became much less of a worrier and my anxiety reduced tremendously. Although this is the opposite of what most people expect, it really was a natural reaction. It took that diagnosis for me to realize that there is no reason to worry over every little thing and life and really the only thing that matters is our health. That didn’t mean that I didn’t lock myself in the bathroom and cry about Joey’s condition sometimes. Of course I did. This is my son and I wanted him to be okay. 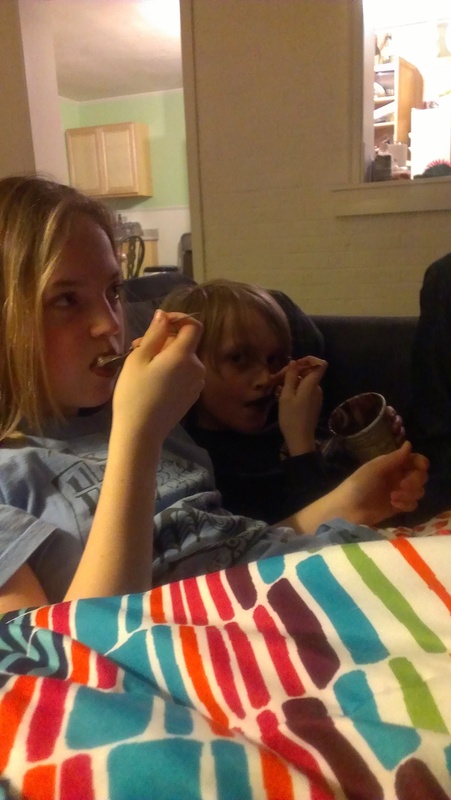 I shed many tears over the last 3-1/2 months worried about my step-son because that is normal. But I have also regained perspective. Life is valuable and it can be taken from you at any moment. It’s important to surround yourself by positive people who build you up and don’t focus on petty bumps in life because the positive people in your life are the ones who will help you get through the big bumps.